M.P. took the Hardest Gary Gygax Quiz in the World and got 40%! 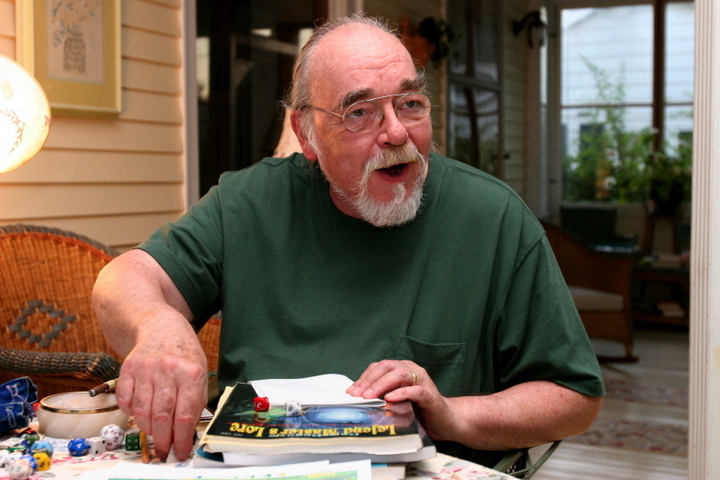 You are a Gary Gygax Hero. You know much of Gary Gygax. You are probably the DM of your game group (but you might insist on being called 'referee'). 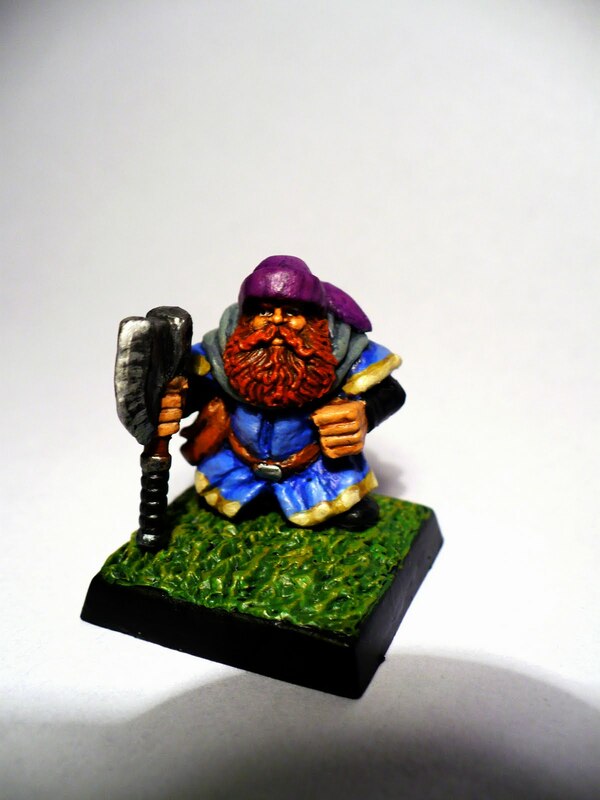 So here's another miniature painted and converted by me. I was inspired by the briliant comic version of the Hobbit, I grew tired of the claded in steel dwarfs. 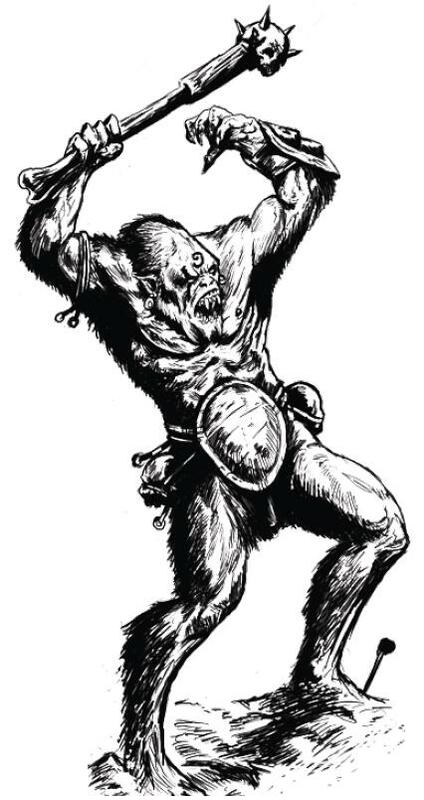 I'm just in the middle of stating monsters up to the standard of Sword & Sorcery RPG, and suddenly I grew tired of skill systems and all this post 3ed. crap, so I'm returning to Sword & Wizardry, but now maybe not to the White Box version but to the Core Rules. With the brilliant monster compendium file from Mythemere publishing It'll be helluva easier work to be done. All this does not mean that I won't be working on my Sword & Sorcery RPG, but for now I need a break to clear my mind. Hill Trolls are a vicious specie that populates most of the hills of Barbaric Frontier. His sharp claws inflicts grievious wounds to its enemies. They live in a small packs consisting 2D4 adults and 1D6 younglings. There diet consists of small animals, some plants. Human meat is treated among them as the most luxurious delicacy. Most of the trolls live in a dug-up holes on sides of hills, where they stack bones and flesh of their prey. 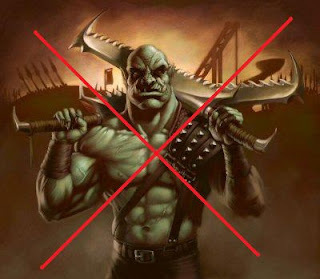 Yes, it's the truth, no orcs of any kind in the Barbaric Frontier campaign. Since it's main theme is clash between barbarians and civilized people there is no need for green race, which are more-or-less barbarians. Their role has been taken by beastmen, who are an outcome of a long forgotten experiment conducted by a Wizard from the Obsidian Citadel. So here's miniature of Warlord Gnaar for my Song of Blades and Heroes games and my sandbox campaign. Basically it's an old Citadel miniature from Warhammer Quest Wizards Box with swapped hands and chainmail made of greenstuff. Well since I'm using my hombrew system called "Sword and Sorcery" in my campaign I thought I'd share few bits of it which differentiate it from all the other simulacrum, d20 games. Citizens of Groβe Reich are all exclusively members of the Church of the One. It’s a monotheistic religion, where the main theme of religious practices is redemption of the primal guilt of disobedience of ancestors. Teachings of the One and his prophets strictly forbids practicing magic which enslaved humanity millennia ago under rule of otherworld entities. 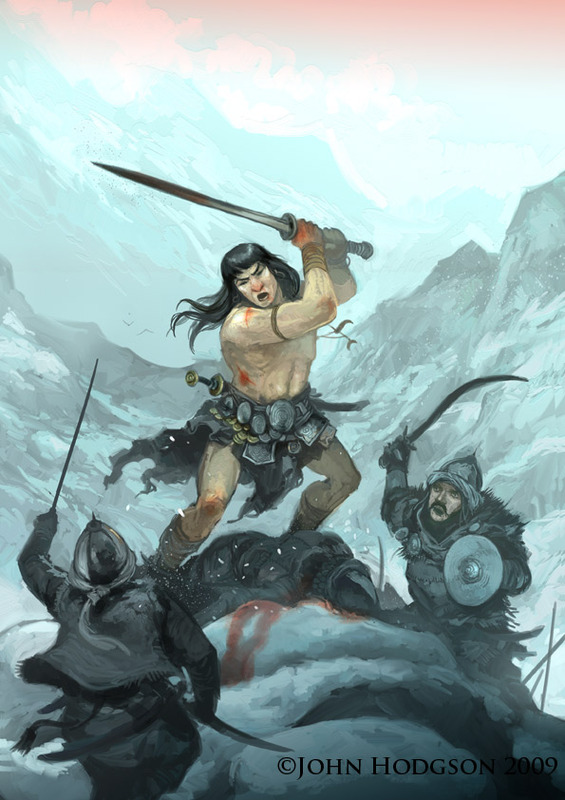 Religion of barbarians of the north is an amalgam of shamanistic and animistic concepts. Those who conduct religious rituals are shamans who contact spirits of the otherworld. Elves do not have a pantheon of gods per se, instead they revere nature in its wild aspect very often calling upon spirits of nature. Dwarfs revere their holy ancestors, great heroes of the past. They do not possess any kind of priest-caste, all religious rituals are cultivated individually, though it often happens in so called “houses of remembrance” dedicated to ancestors of whole dwarfdom. 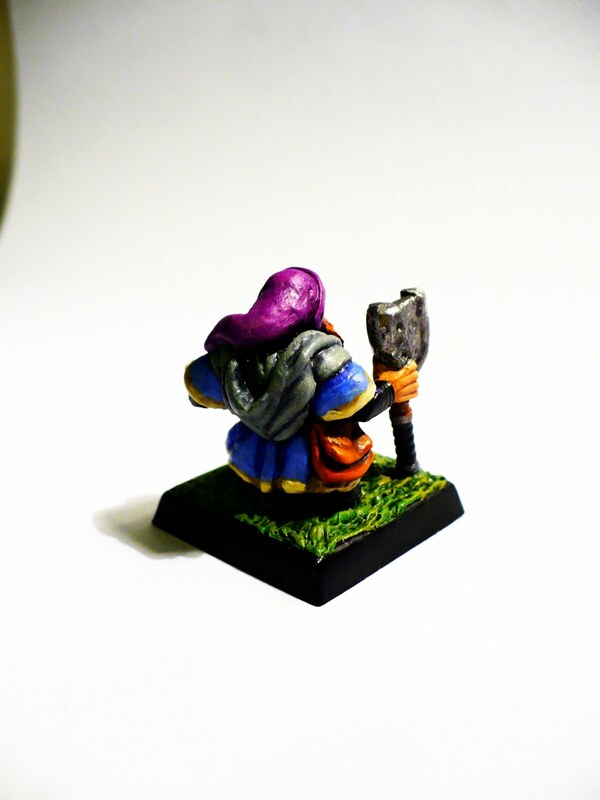 Halflings embrace teachings of the Church of the One with a twist. Their dogma seem to be less strict then that of their human counterparts. 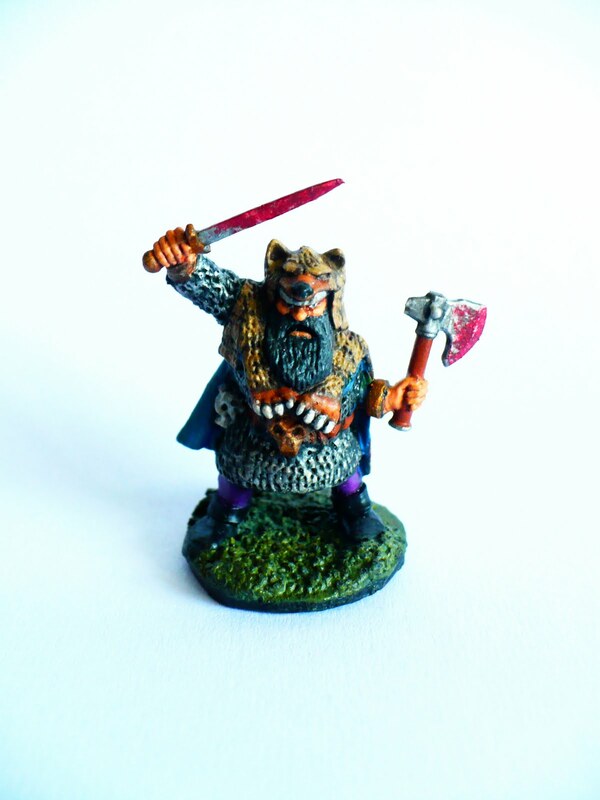 Barbaric Frontier stretches from the east to north of the Nordmark. It’s vast territory is covered by forests, Misty Lake and mossy hills. 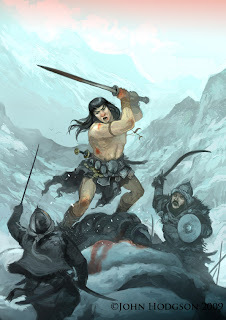 Throughout the frontier live eponymous barbaric tribes of north. They are the major obstacle in the process of reclaiming north for the Groβe Reich. Nordmark was established as march over fifty years ago, when contemporary emperor of the Reich decided to protect northern border of his country and to reclaim long lost north of the continent to the barbaric tribes. Governed by margrave Otto from Goethe aristocratic family. After brief time of prosperity march fall into decline thanks to lost access to the upper part of the Turbid River-the main transportation route from gold mines of Dragon Mountains and Iron Gate Keep. The main settlement of Nordmark is Neuburg, a small walled town build around the von Goethe Keep. So for the five next days I'm off to the Masters of Rock Festival, after this I'm going to return to posting things about my Barbaric Frontier. See you soon. Dungeons & Dragons 3.5 ed. Dungeons & Dragons 0 ed. Call of Cthulhu 6 ed. Here's my modification of Dyson Logos' chararcter sheet. Now you can have a glimpse into my hombrew d20. 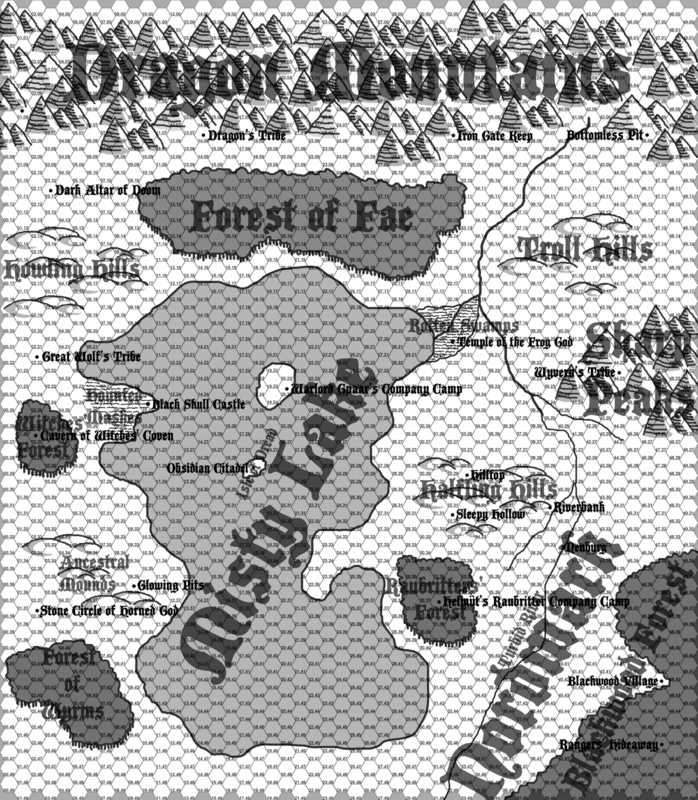 So here's the current map of my campaign, in the following posts I'll describe locations. 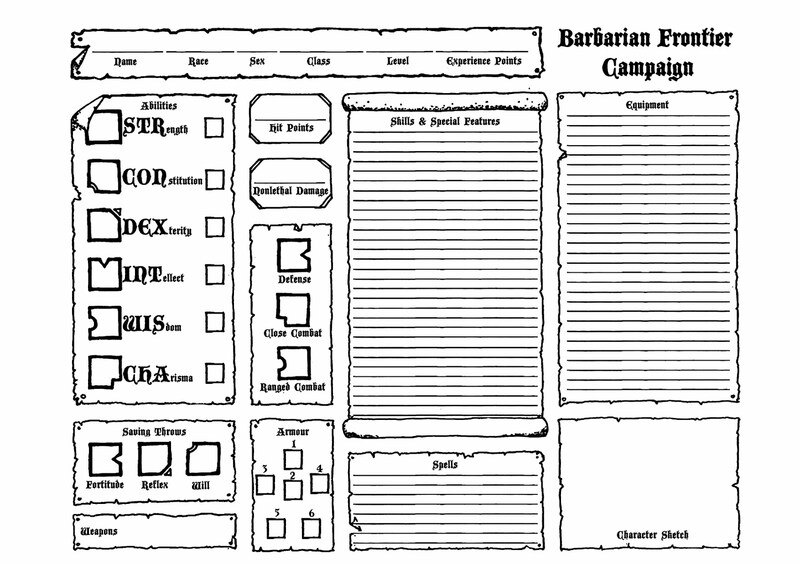 This campaign begun as a break from my usual Planet Cthlol game. 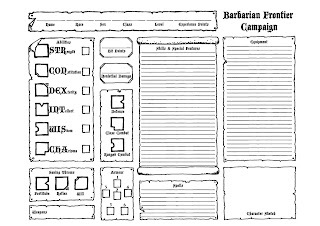 Now it has seriously expanded and I'm going to run it for some other people(other than my usual gaming group), so I've decided to bring here some of my materials, maps, and other relevant stuff. I'm running my rules lite version of d20 system- Sword & Sorcery, which is going to be published for free this autumn.